has performed in numerous concerts, soirrees, & weddings over the past two decades. 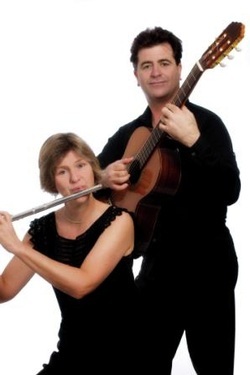 Their repertoire includes classical, jazz, latin & popular classics. Maria Foot (Flute) holds an L.Mus.A on flute, as well as a B.Mus (Jazz) from Adelaide University. For over ten years she worked as a casual flute/piccolo player with the Adelaide Symphony Orchestra. These days her musical pursuits are focussed towards teaching woodwind, conducting and performing. Lincoln Brady (Guitar) holds a B.Mus (Perf.) from Adelaide University and LTCL (Perf.) from Trinity College of Music, London. He has taught and performed classical guitar for over 25 years and is a former Lecturer in Guitar at the ‘Australian Institute of Music’ (Sydney) and at the ‘Flinders St. School of Music’ (Adelaide). Several of his compositions and arrangements are published in America.